ROCKFORD, Ill. – The American Hockey League’s Rockford IceHogs today announced they have signed defenseman Dennis Gilbert to an Amateur Tryout Contract (ATO). Gilbert, 21, was selected by the Blackhawks in the third round (91st overall) of the 2015 NHL Draft. The blueliner recently completed his junior season at the University of Notre Dame where he scored 10 points (4g, 6a) in 39 games. He recorded his first career two-goal game on Dec. 9, 2017 at Wisconsin. The Buffalo, N.Y. native capped his three-year college career with 42 points (6g, 36a) in 116 career college games. 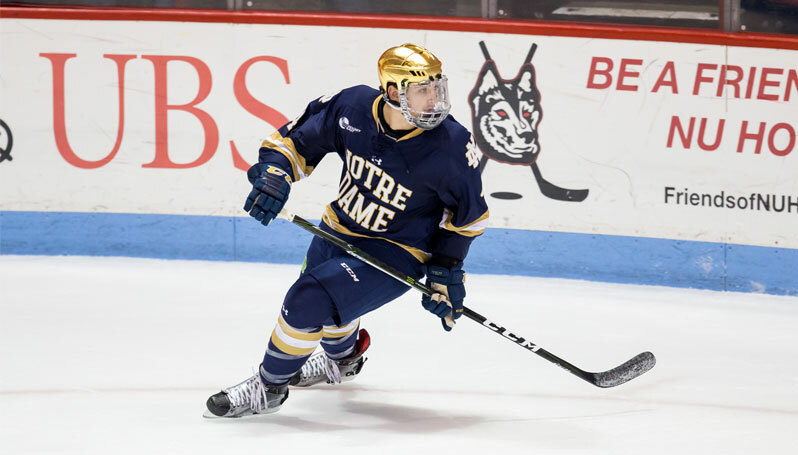 As a sophomore with the Fighting Irish, he helped his team to the Frozen Four and was named the Hockey East’s Best Defensive Defenseman and a Hockey East Third Team All-Star. The defenseman led the team with a career-high +27 plus/minus that season, and ranked first among Notre Dame defensemen with 22 assists during the campaign. Prior to playing at Notre Dame, Gilbert played the 2014-15 season with the Chicago Steel of the USHL, where he tallied 27 points (4g, 23a) in 59 games and was named to the USHL All-Rookie Team. On Friday, Gilbert also agreed to terms with the Chicago Blackhawks on a three-year that begins in 2018-19 and runs through the 2020-21 season.